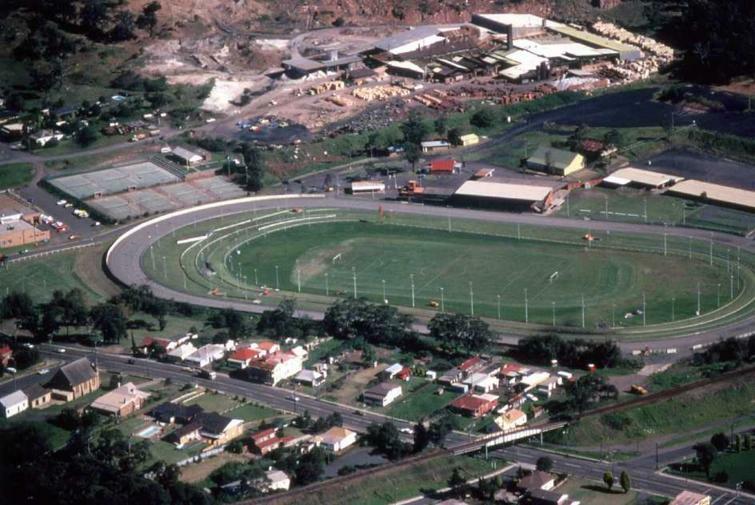 Slacky Flat sporting complex at Bulli in the 1990s. Thirroul Cricket team on Slacky Flat 1908. ARGUABLY Woonona Bulli can boast of two sacred sporting grounds. I know some may disagree, with Nicholson Park at Woonona, and the picturesque soccer grounds of Bulli Park also in contention, but Ball’s Paddock, Woonona, and Slacky Flat, Bulli with their long historical links, I believe win hands down. Ball’s Paddock, the property of a pub, and Slacky Flat, owned by a mining company and later brought into public ownership, attracted large crowds for sporting fixtures during the early half of last century. Chiefly the home to soccer, they have had both forms of rugby, cricket, boxing, wrestling, and greyhound racing on their fields. Sporting fields have always figured high on priority public infrastructure for Bulli residents. From the earliest days of settlement in the early 1860s, when a village developed around today’s Bulli Public School, sport was an important part of life. The coal miners that settled Bulli loved their sport. The first sporting field was a clearing of land owned by the Bulli Coal Company just west of Bulli Public School between Hobart and William Streets, just off Haig Street. The ground became known as the ‘Brick Paddock” and was popular for picnics, sporting events, union meetings and most public gatherings. The original Ball’s Paddock, looking north from the hill near the Woonona Royal Hotel. The ‘Paddock’ was Bulli’s only recreational ground, until local publicans cottoned-on to the advantages of having sporting fixtures near their bars. The publican of Bulli’s Railway Hotel, Jack Floyd, a lover of pugilistic sport, organised a wrestling match in the paddock behind his pub in the late 1870s. The winner of the Queens Birthday public holiday wrestling match, in May 1879, would pocket £10. James Callaway of Dapto took-on Bulli’s Albert Bray in the Railway Hotel’s paddock, located about where the Wollongong City Council’s Bulli works depot is today. After “considerable sums of money changed hands”, the fight was stopped as the sun set behind the escarpment. The match resumed the following morning with Bulli’s Bray eventually declared the winner. Jack Floyd wasn’t the only publican to take advantage of sport beside his pub. 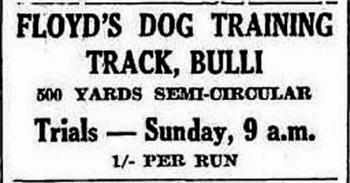 The most famous in the Bulli district would have to be Ball’s Paddock. Originally known as ‘Ziems’ Paddock’, the legendary ground was located where Bulli meets Woonona – today’s Magnolia Green residential estate. Ten years after Charles Ziems established the Royal Hotel he was reported to have cleared and ‘stumped’ a paddock he owned to the north of his pub for a sporting ground in June 1873. When John Heal became publican at the Royal he wisely invested in upgrading Ziems’ old sporting paddock. 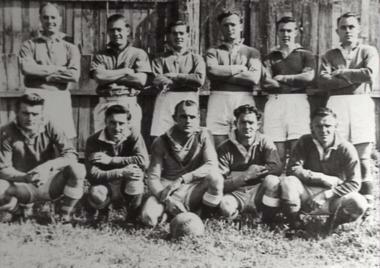 A North Wollongong team poses for a picture at Ball’s Paddock prior to their game in the 1950s. 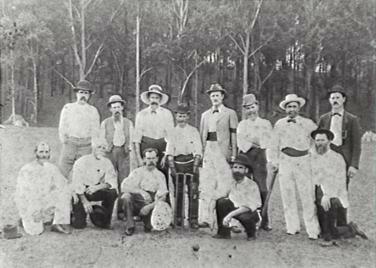 The Illawarra Mercury reported in 1889 he had pegged out the ground for a cricket pitch, and later that year the Bulli Cricket Club was enticed to “give-up” the Brick Paddock and move to the new venue. Later in the summer of 1893, Heal made further improvements to the ground, which was set it to become one of the region’s premier sporting grounds. Lawn bowls could have joined the sports played at the ‘paddock’ when William Rees – who was captivated by the game when he visited England in 1891/92 – tried to establish a club in 1893. He, along with other prominent residents, approached John Heal to include a green at the ‘paddock’. The negotiations, however, were not successful and the club was eventually established in 1894 on land donated by George Cater near Greta Street Woonona. Today, it’s the Woonona Bowling Club. The Brick Paddock was replaced by Slacky Flat as a sporting and social venue during the 1890s. In November 1895 the Illawarra Mercury reported that Slacky Flat, “now that it is covered in grass”, was being used for picnics and other social events. The Bulli and Thirroul Cricket Clubs were photographed playing a match on the ‘Flat’ in 1908, but it was Bulli Soccer Club though who is credited with establishing the ground as the area’s premier sporting venue. The Illawarra Mercury reported on May 16 1913 that “Bulli is making another endeavour to start a soccer club, and a site for a football ground has been secured on Slacky Flat”. Slacky Flat was the home ground to Coledale and Bulli for many years during the 1920s and attracted hundreds of spectators when it hosted the Gardeners Cup. During the 1930s the publican of the Bulli Family Hotel, David Woods, who was Woonona Bulli Soccer Club’s sponsor, leased Slacky Flat from the Bulli Coal Company. A wise move considering he was the closest watering hole to the ground. After a campaign from the Bulli Progress Association, the Bulli Shire Council purchased 50 acres of land at Slacky Flat from the Bulli Coal Company in 1939 for £500 to establish a recreation ground. Today it is owned by Wollongong City Council and is leased by the Bulli Trotting Club, Bulli Greyhound Club, and is home to the Bulli Agricultural Society’s annual Show. Meanwhile at the age of 46, Thomas Ball purchased the Royal Hotel and sports paddock from the Ziems’ estate in 1901. Ball’s Paddock became the premier venue for soccer, boxing and wrestling matches in the Illawarra, and was also popular for miners’ union meetings and other gatherings. The recruitment drive for soldiers to sign-up for World War I, the Waratah March also rallied at the ground. Following the death of Ball, came the sale of the Royal Hotel to Tooth and Company. The brewery giant purchased the pub and sports ground in 1933. Tooth’s leased Ball’s Paddock to Woonona Bulli Soccer Club in 1946. The lease was extended over the following decades and Balls Paddock became the home of soccer in the Illawarra. The brewery sold the Royal Hotel and surrounding land in 1982, and Ball’s Paddock was re-sited to a Wollongong City Council owned park to the west. The new Balls Paddock was officially opened on July 2 1988 and is now home to the Bulli Soccer Club. 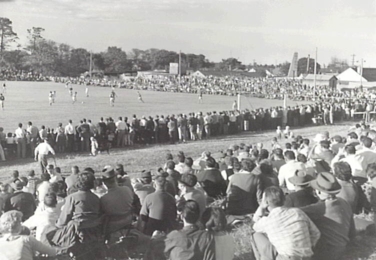 Besides Slacky Flat and Ball’s Paddock though, there was another sporting ground at Bulli that hosted at least one international soccer match, boasted a greyhound training track and pulled large crowds to watch its home team Woonona take on opposing sides in the local competition during the 1930s. The purposely built playing field, Floyd’s Paddock was home to the Woonona Bulli Soccer Club from 1933 to 1935 as a result of a dispute with the lessee of Ball’s Paddock at Woonona. Floyd’s Paddock was located on a flat parcel of land between Ursula Road and Whartons Creek, near the intersection of Benelong Street. The ground was pegged-out on part of Jim Floyd’s cattle farm, which was bounded by the South Coast Railway, Farrel Road, Ursula Road and the beach. Ball’s Paddock, leased by Woonona Royal Hotel publican Sam Moore, had been home to the Woonona Soccer Club for over 30 years when a dispute between the two parties arose in the early half of 1933. Moore proposed that soccer share his field with rugby league. Woonona Club created a football sensation at their last meeting, when a full house of round ball enthusiasts turned up to hear the latest developments concerning the conflict between the Soccer, Rugby and Publican. After a lengthy discussion, Woonona Club decided to vacate Ball’s Paddock and have taken Floyds Paddock, opposite Bulli railway station. This decision has caused a stir in sporting circles, as Soccer has held and played on Ball’s Paddock for the last 30 years. The licensee of the ground wanted both codes to play on his ground, which is very unsatisfactory, and has proved in the past unworkable. Woonona roundball followers pointed out the disadvantages which would be created, but the publican was adamant. Now it will be proved conclusively that Soccer was the best paying proposition, as Rugby followers are few at Woonona. However, Bulli publican will reap the benefit of Woonona’s loss. Floyd’s Paddock is handy to the station, and can easily be made one of the best grounds in the State, as the willing workers intend making an enclosed area that will not want an army to look after a Scotchman’s Hill, which is now prevailing on Ball’s Paddock. The writer congratulates Woonona Club on their solid stand, as it is useless, arguing with one that wants everything played in his back yard. Soccer tried, for years to play on Wollongong Showground, but the Trustees repeatedly that the Rugby League were in first, and they could not see how two different codes of sport could play with satisfaction. Although Woonona have spent a considerable sum making the ground what it is, and all the time the public can reaped the benefit, they are not down hearted in the least over having to leave the fence and other materials, on the old ground, as they will have a free hand in their new venture. New Zealand game will also take place on Floyd’s Paddock, and as this season provides for mainly inter-state and other big fixtures, Woonona business, people will lose a considerable amount of business, particularly the main, business next to the ground. And another important factor is that round ball followers intend supporting those people that support Soccer. The attendance at the meeting was said to be a record for any soccer club in the State at the time. One hundred and forty members paid their membership fees to entitle them to vote. These, with the financial members of the club made the total of financial members 168. A committee was formed and correspondence was read from the two publicans, Mr. R. S. Moore (Woonona Royal Hotel) and Mr. David Woods (Bulli Family Hotel) offering a yearly donation of £30 of the newly formed club played on their respective grounds for a period of five years. Many spoke in favour of each ground. The president, J. Molloy, at this stage had his hands full to retain order and give the speakers a hearing. The division resulted in the offer of David Woods being accepted by a majority of 87 to 71 votes. Sir, – Would you kindly publish the following concerning Woonona club. At the moment a move is on foot to transfer back to Ball’s paddock, Woonona, after almost being requested to quit last season. The lessee of Ball’s paddock and Woonona club held several conferences last season without being successful, as the lessee insisted that Rugby League would be played on this ground on alternate dates to soccer. This Woonona club would not tolerate, and they had no alternative but leave the ground. This coming season there is not any Rugby League club, and hence the move to return back to Ball’s Paddock. The most peculiar position is that Woonona members are not acquainted with the facts as it is freely rumored that the State League has given Woonona permission to return to Ball’s Paddock. Surely the sporting public of Bulli and Woonona are not going to have dust thrown in their eyes to swallow? such as that as there is a special select committee of the State League of which Woonona have a direct representative, and naturally they take notice of that representative on the committee, as he would be in a much better position to account for the South Coast than any other gentleman on that committee. Woonona club entered into an agreement with the proprietress of Bulli Family Hotel and lessee of Floyd’s Park to play there for five years. The proprietress immediate gave them a handsome donation, and also agreed to pay six shillings per week for the rent of the ground throughout the year. She has kept to her bargain, but in spite of this generous treatment, there are secret moves to get back to Ball’s Paddock. Now, where does the five years’ agreement come in? Does Woonona club expect public patronage this coming season? If they do, they had better stay at Floyd’s Park, and stick to the people that stuck to them when they were in distress, and not be misled by any select committee decision. On their decision rest entirely whether the game is to go ahead, or drift hopelessly out of existence by not standing up to honorable agreements. – Yours in sport, JUSTICE. Soccer football will again be played on Slacky Flat, and the kick-off will be an official practice match this Saturday, 16th March, at 3.15. All players who have been signed on for the club are asked to be in the dressing room, Bulli ‘Hotel, at 2.30 on Saturday, and any intending player, or players who would like a trial with club are invited to attend. The newly formed Woonona Soccer Club, who had a team in the state competition, formed in 1934, and played on Ball’s Paddock from the 1935 season. Floyd’s Paddock was used as a greyhound training track during the late 1930s, and several attempts to gain a license for racing on the grounds were unsuccessful. Floyd’s Paddock again lost out the Slacky Flat, who eventually gained a license for greyhound racing in the 1940s. Floyd’s Paddock was eventually subdivided and sold-off for housing in the early 1950s.